I've been working hard to post three times a week in 2018. That was my little goal to myself for i am rorie. Last week I shared three vegan party foods that are easy and undeniably delicious. First, I made Homemade Pizza Rolls that are a touchdown for vegans and nonvegans alike - what's not to love about pizza? Then, I answered your buffalo sauce loving prayers and shared my Vegan Buffalo Chicken Dip that will take you no time to whip up and probably no leftovers, either. On Friday, I shared my Crispy Avocado Fries that will likely be the easiest battered food you ever make at home. Now it's time to get to something a little healthier. I'm all about the condiments. Take a quick look in my fridge and you may consider that I have problem. Not enough people appreciate that condiments are equally as important as the main dish! Making creamy anything when you're vegan can pose as a challenge, because "creamy" itself implies dairy. There are few vegan items that can create and compete with the perfect creamy texture that dairy offers. Enter tahini - the creamy vegan lifesaver. 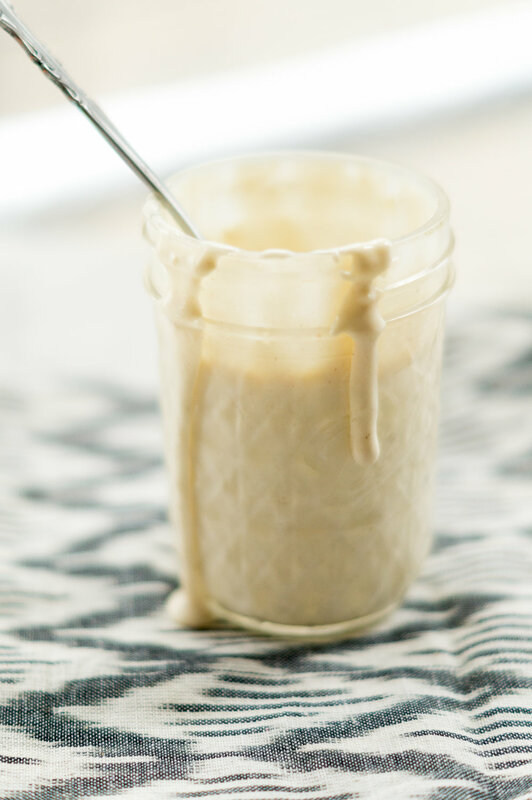 Tahini is a sauce made from ground sesame seeds and has a nutty flavor with the consistency of an almost watered down peanut butter. However, the real star of this dressing is the Forager's Project Cashewgurt. This yogurt is totally vegan and full of healthy probiotic bacteria which helps promote healthy digestion. It's perfectly tangy with a slight sour taste to it, reminding me of Greek yogurt. Add all the ingredients to a food processor and blend until smooth and well combined. Pour into a self-sealing jar to keep fresh. Serve over salads or add to wraps!